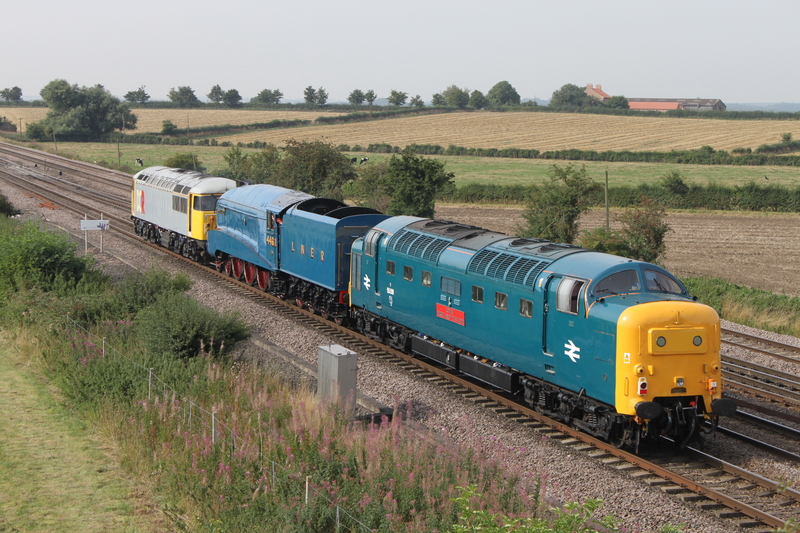 We are extremely sorry, but due to an error, the full article about this year’s raffle does not appear in the current issue of Deltic Deadline. The full article is reproduced below; including important information about what to do to enter the draw and other advice to help it run smoothly. The draw itself is not affected in any way by the error and it will proceed as normal. If anyone needs anything further, please contact me using the contact details inside the back cover of Deltic Deadline. Thank you for you understanding and good luck. The draw will take place after lunch on the 11th of January 2013 at the Depot. Our Society has had a busy and successful year, but we cannot rest on our laurels. There will always be something new to challenge us and stretch us to achieve more than we have done before. Alycidon needs keeping mainline certified, RHF needs keeping in good order for use on preserved lines (where it’s more accessible to members) and Tulyar needs completing. I suspect some will say we’ve got the begging bowl out again and roll their eyes. I view it more that this Society would not exist and we would not be able to enjoy Deltics in the 21st Century without the generosity of our members and our many friends going right back to the park in Northhampton, where our three founder members decided it was possible to save a Deltic for the future and keep it running. Hence, we keep asking for your support and I run this raffle every year. We are now getting to a point in our engineering lifecycle, where we have to carry out some serious engineering on bogies and power units to allow us to move forward. Therefore, fundraising is going to become even more critical than ever before. We will have to invest in new facilities and contract to get some of the big jobs done that are beyond what we can do ourselves. Also, if you know anyone who can help us with lifting equipment at the right price for our power units, please contact me. There will be more information on this in the run up to next year’s AGM in York. The strategy is being actively worked on at the moment. So, please could I ask everyone to really try to sell as many tickets as possible this year? If you can’t sell some tickets, then please could you think about doing some other form of fundraising? Every little helps and everybody’s support is really appreciated. Please fully complete all of the counterfoils. I cannot pay prizes to people, if I don’t know who they are! Please make sure that you have enclosed payment for the tickets. People do regularly forget to send a cheque with their tickets. Where you have asked us not to, we endeavour not to send raffle tickets to you. I apologise in advance, to those of you who object to receiving tickets. If you feel that you should not have received them, please throw them away. Thank you to the Editor and the team for packing the tickets with your copy of Deadline. The raffle would not happen without their hard work. Good luck and compliments of the season to you all! As previously advised in ‘Deltic Deadline’, the annual DPS Members Day will take place at the NYMR this coming Saturday (September 14th) as part of the railway’s anniversary diesel gala. DPS members will be entitled to a reduction of 50% off fares on this day on production of a valid membership card – this means a Pickering-Grosmont adult rover will cost £11.50, and one also covering the Grosmont-Battersby/Whitby line will cost £14.50. As a reminder, D9009 is booked to work the following trains on the day: 09.45 Grosmont-Whitby, 10.30 Whitby-Battersby, 12.30 Battersby-Whitby, 14.25 Whitby-Grosmont, 15.23 Grosmont-Pickering, 18.10 Pickering-Grosmont. The full NYMR timetable for the day can be found at http://www.nymrdiesel.co.uk/timetable/gala19.htm - members starting at Pickering will note there is an 08.28 Pickering-Grosmont service which should connect with D9009′s first working. There will be a DPS raffle on board the train, as well a chance to see the latest sales items. The main DPS sales stand will be at Pickering but it will be possible to order on the train and then collect on arrival at Pickering later to save waiting around. We look forward to seeing many of you during the course of the day. Tuesday September 10th: D9009 will run from the East Lancashire Railway to Kidderminster on the Severn Valley Railway, where is will collect a pair of Diesel Hydraulics, D821 ‘GREYHOUND’ and D1062 ‘WESTERN COURIER’ for movement to the North Yorkshire Moors Railway. D9009 is booked to join Network Rail metals at Castleton Hopwood Groundframe at 06.08, then leaving Castleton at 06.46, travelling via Crewe and Bescot to Kidderminster (10.55 at main line station, 11.26 onto SVR). 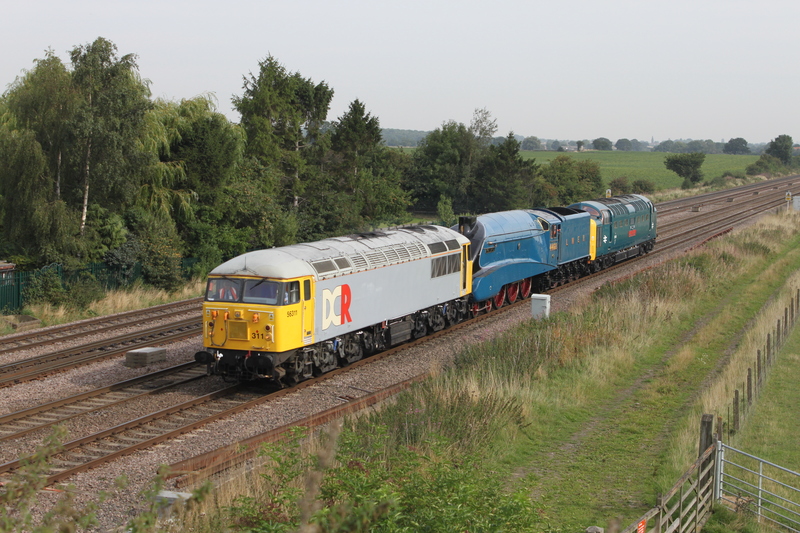 Complete timings can be obtained at http://www.realtimetrains.co.uk/train/U50709/2013/09/10/advanced , Following this, the convoy is scheduled to run to York. Confirmed times have now been received but departure from Kidderminster SVR is expected to be at 12.10, then Bescot 13.44, Stafford 14.39, Crewe 15.13/15, Stockport 16.08, Rochdale 17.08, Hebden Bridge 17.27, Wakefield Kirkgate 18.08, York 19.15/16, York NRM 19.40. Please remember, moves such as this can run early or late. As planned, 55019 moved from York to Grantham with 4468 ‘Mallard’ earlier today in readiness for its display there this weekend. Devon & Cornwall Railways’ used 56311 for the convoy movement which ran pretty much to time throughout the journey. The two pictures below show the convoy just south of Colton Junction. The event at Grantham, which marks 75 years since ‘Mallard’ attained its 126 mph speed record, takes place between 10.00 and 17.00 on Saturday September 7 and Sunday December 8. We expect 55019 to be open for cab visits and theres should be several ‘Deltic’ nameplates on display. 09.08 ex Grosmont, 10.36 ex Pickering, 13.21 ex Grosmont, 14.51 ex Pickering, 16.11 ex Grosmont, 17.14 ex Goathland. NB: The trains in italics are the ‘Moorlander’ Sunday lunch train and have limited seating for non-diners. If you would like to dine on this train, please contact NYMR Customer Services on 01751-472508. As most people will know, D9015 ‘Tulyar’ is in the final stages of an extensive and lengthy overhaul. We are desperately seeking funds to raise the money necessary to complete the repairs. Our Head of Mechanical Engineering & Education Officer, Alex Williams, has come up with a ‘Pint & Packet of Crisps’ appeal to finish ‘Tulyar’, and supporters are invited to set up a Standing Order to donate a suitable amount, or whatever you can afford, towards the completion of the loco. A Standing Order form, which should be printed out and sent to Peter Kennan at the address at the bottom, can be downloaded by clicking the link below. Many thanks in advance for your support. August 26th: D9009 will run at the East Lancs Railway on the diesel diagram (Bank Holiday Monday). Check ELR Diesel website for information – see http://www.elrdiesel.info. (Around) September 12th: D9009 will leave ELR and travel light engine to the Severn Valley Railway to pick up D821 and D1062 and take the convoy to the NYMR for their Diesel Gala on September 13th-15th. Unfortunately this event clashes with an event where the NRM’s 55002 is appearing at Doncaster Carr on 14/15 September (with Mallard). This event in turn follows the Grantham event on 7/8 September which 55002 is appearing at with Mallard. 55002 is then booked to appear at the Mid Norfolk Gala on 20th-22nd September. September 13th-15th: NYMR Gala – D9009 will run on all 3 days at the NYMR Gala and will run out to Batterby on the Saturday. Saturday 14th is DPS Members Day and so if you are a DPS Member please check Deltic Deadline for further information. This should arrive in a week or so. More info here in due course. September 28th/29th: 55019 will be appearing next to Mallard at the Barrow Hill Live “Doncaster 160″ event on 28th/29th September. Not yet sure whether it will be running. Prior to this, there is a Deltic fans social evening at the Corner Pin pub in Doncaster from 6pm. All welcome! October 4th/5th: D9009 will take the return convoy from the NYMR to the SVR and then stay at the SVR in readiness for the line’s gala. It will take part in the SVR Diesel Gala on Friday and Saturday only (4th/5th October). 55002 will also arrive for that event. October 11th: After the SVR event, D9009 will be part of the convoy hauled by 55002 back to the ELR Bury and will then undertake an ELR Footplate Experience Day on 11th October. The Society’s Members Day will take place on September 14th this year at the North Yorkshire Moors Railway during the line’s Diesel Weekend, which is celebrating its 30th anniversary this year. The NYMR’s first Diesel Gala took place in 1983, and D9009 ‘Alycidon’, which was one of the locos which appeared at that event, will be returning to the line for the weekend. It will be joined by D821 ‘Greyhound’ (another former NYMR resident) and D1062 ‘Western Courier’ from the Severn Valley Railway, plus 31128 ‘Charybdis’ and Classes 08, 24, 25 and 37 from the home fleet. D9009 will run on all three days of the gala (September 13th-15th). On Members Day, the Saturday, the loco will run to Battersby – if you are a DPS member, please see the next ‘Deltic Deadline’ or check back here nearer the time for further details. We look forward to seeing many of you at the NYMR, which was the society’s first home when 55009 and 55019 were saved in 1982.